Welcome to my Food Blogging Resources page. If you are thinking of starting your own blog, here’s what you need to get started. All of these recommendations are used by me personally. If you have been thinking of getting started with food blogging I say go for it! It is a lot of work but it’s incredibly rewarding and perfect as a part time gig from home AND you get to eat your work! First, you will need a place for your food blog to live on the Internet and I suggest a self-hosted WordPress site like I have. I use WPOPT for my hosting and I couldn’t be happier. I switched about a year ago from Bluehost and it’s been smooth sailing ever since. The support is top notch and I always get quick answers to my questions. You can quickly add a theme which is basically the backbone of your webpage. They are so easy to use and make creating a webpage super easy. Genesis is the WordPress framework I use and many others use it as well. On top of that, I have my WordPress theme which is Foodie Pro. I love the simple lines of this theme and the designer Shay Bocks has lots of tutorials to help you set it up. There are so many plugins to choose from that it’s easy to get in over your head. My advice to you is only use those plugins that you need. It might be cute to have a plugin that provides commenters the ability to use hundreds of different emojis, but is it necessary? If not, don’t use it because it will slow your site down. WP Recipe Maker – This is a must have recipe plugin that provides your recipes with all the markup needed to show up in Google searches. It also provides more detailed nutrition information if you buy an add-on. I have tried many different recipe plugins and this is by far the best one out there. Akismet Anti Spam – Another must have! This plugin automatically deletes the most obvious spam comments and holds the others in moderation for your review. Imagify – I use this to image optimization tool to reduce the file size of my photos and make my site run faster. Huge photos can really make your site lag. Social Warfare – I held off on using this one for awhile but now I love it. This plugin places social share buttons in places where readers will actually use them. They keep count of all your shares and you can post that number for social proof. I have the number of shares posted in my sidebar now. The buttons are customizable and can be matched to any color you choose. WP Instagram Widget – I use this plugin to showcase my latest pins on Instagram at the bottom of my site. It’s helped me to grow my followers on Instagram. WP Rocket – This is 100% necessary! It helps your site load faster by caching your pages. Yoast SEO – I can’t even begin to explain all the things this plugin does but it’s a must have for sure! It takes care of your XML sitemap and breadcrumbs. The best part is that it helps you set up each post for the best SEO possible without even thinking about it. 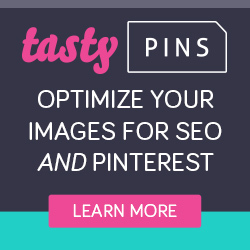 Tasty Pins – I just started using this and I am loving it. It allows you to meet the needs of Google and the alt tag while also meeting the needs of Pinterest by adding an awesome pin description complete with hashtags. It saves so much time! Tailwind – The most efficient and affordable way to schedule to Pinterest and quickly grow your following. I use it to schedule all my posts and to schedule content from all my favorite bloggers in the same niche. Imagine setting your Pinterest schedule for the month in ONE DAY. More time to create awesome content! Boardbooster – I actually gave up BoardBooster when I started with Tailwind but I now find that using both has resulted in huge Pinterest growth. BoardBooster makes it super easy to post content to group boards with campaigns. They also have groups called Tribes that you can join with some like minded bloggers and share each other’s content. Mailchimp – I love Mailchimp because of its ease of use and price. It’s free for under 2000 subscribers so it’s great for those just starting out. Hello Bar – Another way to convert visitors into subscribers. Use Hello Bar to add a simple sign up bar at the top of your page. Canon EOS 5D Mark III – This camera is dreamy. I’ve only had it for a few months but it is capable of so much. I can take photos in less light by bumping up the ISO. It is able to focus on just about any point in the photo with a 61-point AF system. It’s amazing! Canon EF 50mm f/1.4 – This is a standard focal length lens and I use this most of the time. It’s perfect for all lighting situation. Vanguard Alta Pro 263AB 100 Aluminum Tripod Kit – This tripod is the most versatile for all your photography and videography needs. Food Blogger Pro – I couldn’t have done any of this without help from Lindsay and Bjork from Pinch of Yum. I belonged to Food Blogger Pro for several years when I was starting out and I watched every single video they offered. If I didn’t see the answer to a question I could always post a question and get it answered ASAP. I highly recommend this if you are in your first few years of blogging. The Blog Village – I have recently discovered the Blog Village and I love it. So many resources and top notch tutorials. This is great for beginners and those that have been blogging for years. I am loving the Show Me The Yummy Video Workshop too! Tasty Food Photography – This is another invaluable resource from Linsday! The single best resource for looking to photograph food. Plate to Pixel – Great resource for food photography and styling ideas. Will Write for Food – Writing is not my favorite part of blogging and this is packed with advice on becoming a better writer. This page contains affiliate links and I may earn a small commission if you make a purchase. Thanks for supporting Seasonal Cravings. Don’t forget to pin this to your blogging resources page on Pinterest! Best of luck starting your own food blog!